Journalist wearing a gas mask on Mansour Street. 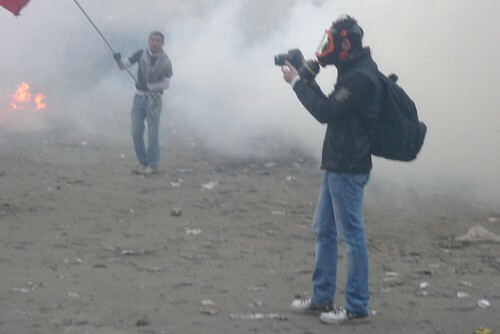 A photojournalist in a gas mask on Mansour Street during protests near the Ministry of Interior in central Cairo in February 2012. Later, in 2014, a reporter commented that a gas mask was the only free piece of safety equipment provided to him by his newspaper ( www.thecairopost.com/news/106461/inside_egypt/reporter-li... ) but in 2012 I think even these were still mostly bought by journalists themselves. I purchased a cheap mask ( about three Egyptian pounds ) from a street trader who was selling dozens to protesters but it was not even suitable for domestic DIY let alone CS gas so I crammed it in my pocket together with a useless pair of plastic swimming googles that kept slipping from my face. From the start of the uprisings in January 2011 until today journalists have remained prime targets of security forces and other pro government militia. As soon as they reveal a camera it is as if they instantly mark themselves as a "bulls eye" for police snipers and also to any roof top militia who may be throwing rocks or stones. In December 2011 pro government militia on the rooftop of the Egyptian Institute near Tahrir Sqaure deliberately aimed stones at myself even though I only carried a pocket panasonic LX5 and especially at those photojournalists carrying large telephoto cameras. I have one photo on file of one of these men deliberately throwing a rock at me. On 26 January 2014, an article in El-Wady News noted that 19 reporters and photojournalists had been detained on a single day, the third anniversary of the 2011 uprising, with their cameras seized while two others had been injured by live fire and others assaulted. ( source Cairopost.com 15.04.14 ). Another 12 journalists had been convicted in Egyptian courts in absentia - meaning in most cases that the journalists had been able to leave the country but can not now return without the risk of being arrested and imprisoned. ( cpj.org/blog/2015/09/beyond-the-pardons-press-freedom-sti... ).